Pearls of Wisdom is our intergenerational project bringing young and old together through art. It started in 2015 as part of our Eastside Creates programme (link to that), with an intergenerational tea dance at Ditchburn Place inspired by Islington-based Cubitt Arts, with social enterprise Turtle Dove, funded by Suzy Oakes Trust and Cambridge City Council. We have since run two more Pearls of Wisdom projects, partnered with charity Care Network Cambridgeshire – one in 2016, celebrating Care Network Camb’s 30 year ‘pearl anniversary’ as part of our We Are Family progamme (link to this on our site), plus Pearls of Wisdom Postcards in 2017, supporting children from the Grove Primary School in creating postcards with elderly residents in Cambridge. Children won the High Sheriff Award for their participation in the project. 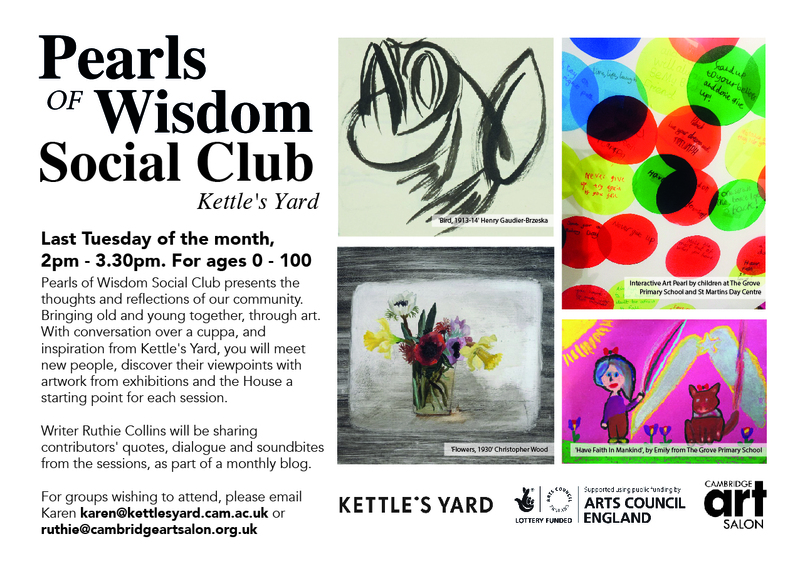 We currently run a monthly Pearls of Wisdom Social Club at Kettle’s Yard (link to news item), on the last Tuesday of every month – bringing old and young together, through art. Please email karen@kettlesyard.ac.uk or ruthie@cambridgeartsalon.org.uk to enrol at the club. Pearls of Wisdom uses contemporary art to celebrate the voices of older people in our lives. What nugget of wisdom have you learned in your life? What advice would you give to your younger self? Community partners are also invited to support the project. We are exploring how family and intergenerational arts activities improve communities, inspire positive change, or promote social cohesion. How can a collaborative approach help those that do not normally engage with the arts, access them?